Sunsets are one of the great pleasures in life, and it is always worth the effort to get outside and see them as often as you can. In Squamish, there are numerous spots to watch the sun go down, from the ocean to the summits of the local peaks and a few spots in between. Here are our favourites. There’s nothing better than watching a sunset on the ocean. Just a short walk from downtown Squamish, Nexen Beach is an awesome place to wind down the day. When the sun sets, the glow of the Stawamus Chief, Garibaldi and Shannon Falls is spectacular. This definitely requires a little more oomph to get up and possibly a headlamp to get down, but if you’re fit, technically savvy and comfortable in the mountains, watching the sunset from the summit of the Stawamus Chief is breathtaking and something you will remember forever. Wine, food, and sometimes even live music all viewed from a deck with one of the best views in all of BC. The sunsets from the Summit Lodge at the top of the Sea to Sky Gondola are not to be missed. From the Sky Pilot Massif to the Stawamus Chief, Mount Garibaldi, the Tantalus Range and Howe Sound, the views from the summit of the gondola are fantastic and make for one of the best places to end your day watching the sun disappear behind the mountains. There’s nothing like camping on the ocean. Even better is renting one of the cabins on the shores of Howe Sound in Porteau Cove Provincial Park. Either way, the sunsets here are beautiful and make for one of the best places to watch the evening glow of the sun on the waters of the Sound. 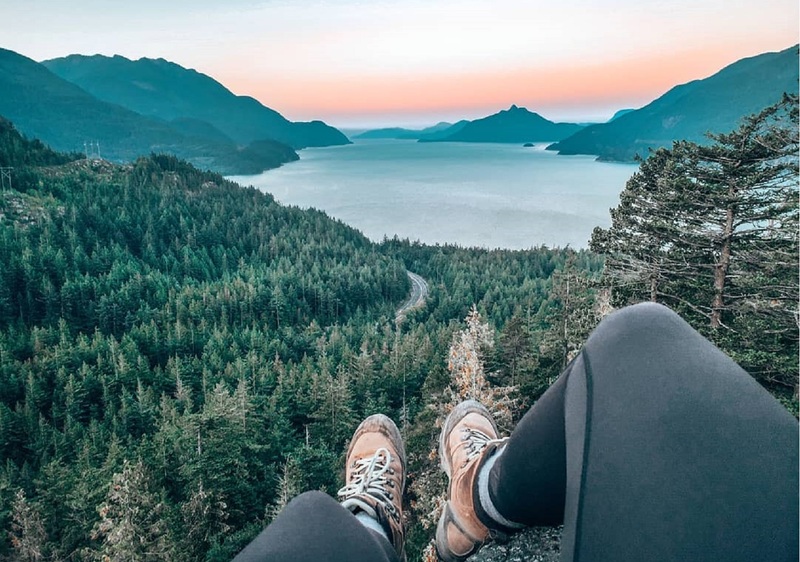 Along the Murrin Park Loop Trail in Murrin Provincial Park, there are two lookouts with small benches that give panoramic views of Howe Sound. The Sunset views here breathtaking. The mountains and the ocean come aglow with that perfect evening light. Bring a thermos of tea and some snacks and enjoy the end of your day. Located 11km into Garibaldi Provincial Park on an alpine ridge, Elfin Lakes is one of the best places to camp in Southern BC. Be sure to arrive early enough to watch the sun go down. The alpenglow on the surrounding peaks and glaciers will leave you wanting to stay. That time of day when the sun starts to go down is magical. Everything is a little crisper and a little more beautiful. Sunsets are a good reminder of why we live in one of the most beautiful places in the world.